Dear CMA Community, We are proud to introduce our new CMA Token Staking plan which now gives 100% bonus on CMA token staking balances of 500K or more. Why are we increasing the staking rewards? As you know, CoinMarketAlert is a product and customer focused company. Our token is designed to be a utility token and utilized within CoinMarketAlert for current products and upcoming services (See 2019-2020 Roadmap Here). Currently, we are splitting our focus on both product and CMA token. In order to total focus on building the next level of products and services, we need to distribute the remaining CMA tokens as soon as possible. By doing so, we can achieve an increase in CMA token price, getting CMA listed on a top exchange such as Binance, OKex, ZB.com and so on, reach the next level, and be in a position that we deserve. In order to reach these immediate goals, we need our entire community to support us by taking advantage of the staking bonus. We are aware that the current amount of CMA tokens available for purchase on the exchange is limited and the prices are very low. Based on our analysis and company valuation, the token price should range between $0.02-0.05. Actually, the market can’t really determine the price because the traded volume is to low in order to value CMA Token correctly. We are working hard to reach this point and we are really confident that is going to happen soon. CMA tokens can be purchased on Ether Flyer exchange. Hold at least 500,001 CMA Tokens in order to start staking and get the following Percentage released monthly. You’re staking rewards will be distributed each month based on your individual staking start time and not at a predetermined date like before. After 6 months, based on the remaining token supply, we may let everyone stake for another 6 months at a different percentage from the first 6 months. 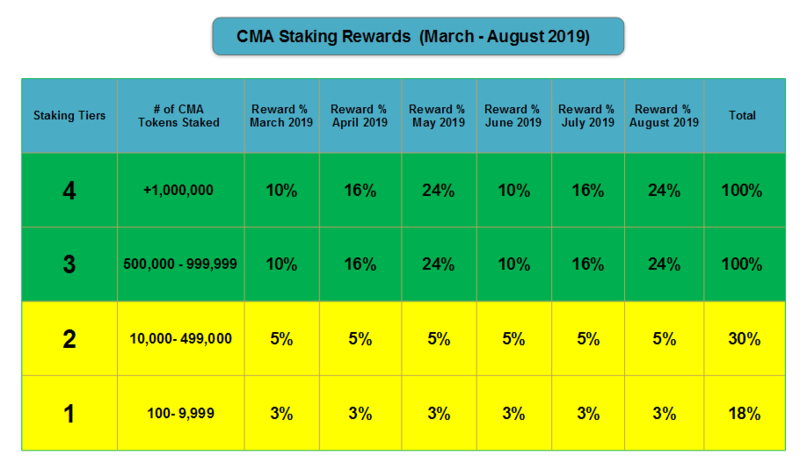 Everyone can stake if a wallet holds at least 100 CMA token for at least 30 days and receive the following rewards: ~0.13% daily compounded (Month 7 -12). - Select the Staking Manager button located on the right side. - On the Staking Manager page, enter the Ethereum wallet address which holds your CMA tokens. - Set a withdrawal pin. - Click button "Withdraw CMA Tokens"
Your tokens will be transferred within 3 hours to your wallet. Please withdraw your tokens as soon as possible.